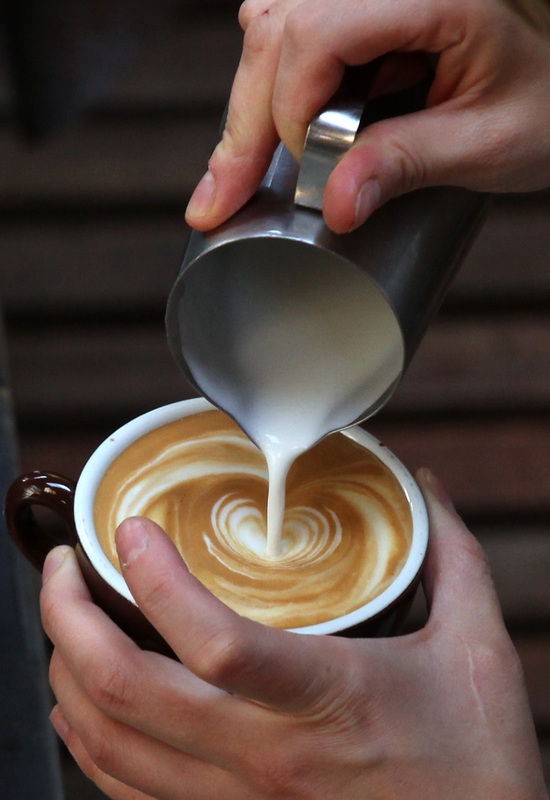 Coffee drinkers are a special breed of people — no, literally. This week, we learned that you may be a coffee drinker because of your genes when a new study found that coffee consumption can be directly attributed to six genetic variants. The study, conducted by Marilyn Cornelis of the Harvard School of Public Health and published Tuesday in the journal Molecular Psychiatry, found that how much coffee you prefer to drink (and how often you like to drink it) appears to be genetically predictable. However, when coffee and tea drinkers are studied side-by-side, there are some clear personality differences. Here's what the research has to say about the difference between those of us who prefer coffee to tea. Surveys out of the U.K. have found that coffee drinkers not only make more money than tea drinkers, but also get more pay raises. There’s no scientific explanation as to why that might be, but you can take your guess. Although tea drinkers, on average, do make less, the same study found that they do at least tend to be more fair. Fairness, I hear, is a good quality. With all that caffeine pumping through their veins, you’d think coffee drinkers would be more stressed. But apparently, while tea drinkers take the cake when it comes to being more laid-back and having lower blood pressure, they still report more stress than those who drink coffee. When it comes to being “very stressed,” only 10 percent of British coffee drinkers were in touch with that emotion, compared to 12 percent of tea drinkers. I totally get this! I will force myself to stay at my desk until I finish something, then reward myself with a walk around the block, allowing myself to finally pee (after all that coffee), or even finally have lunch. It’s the coffee drinkers who respond more positively to a reward system, and in a lot of cases, that reward is just more coffee for them. While tea drinkers tend to stay calm, cool, and collected in different situations because of the laid back factor, coffee drinkers tend to be more stubborn. According to psychologist Harris Lieberman at the Military Nutrition Division of the U.S. Army Research Institute of Environmental Medicine, a coffee drinker — especially one that is sleep deprived — is a vigilant, focused, attentive person who can be argumentative in trying to prove why their way is the right way, even if it’s technically not the right way at all. Researchers also find that coffee drinkers can be a bit ignorant and hot-headed, at least when it comes to getting things their way. Studies of coffee drinkers have found that 49 percent of American coffee drinkers would rather give up their phone for a month than be denied their favorite beverage, and 55 percent would rather gain 10 pounds than give up coffee for life. I mean, just look at those stats! Those are the statistics of a people who would walk through fire to save you … if you were holding a cup of coffee on the other side. While exact numbers on those addicted to tea are debatable (because tea gets lumped into the caffeine addiction category) we'd bet the addiction to tea — much like its lower caffeine content — isn't quite so extreme. It doesn't matter if they've been consuming coffee all morning. Whether they're trying to get to work on time or meeting a friend for lunch, it's those coffee drinkers who tend to run later than tea drinkers, (at least in the United Kingdom, where the study was conducted). Maybe it's because, on average, we're too busy enjoying our coffee to get to where we're supposed to be on time? Every time I hit up a coffee shot in Greenpoint, I can see how the coffee drinkers might consider themselves "funky and edgy," but who even uses those words out loud? Research has found that while tea drinkers tend to be more casual in their fashion choices, when it comes to considering themselves "funky," it's coffee drinker Brits who are all over that look. Oh, and edgy, too. Almost forgot edgy!